Many of the Dales stories collected by W.R. Mitchell are stories about farming and agriculture. 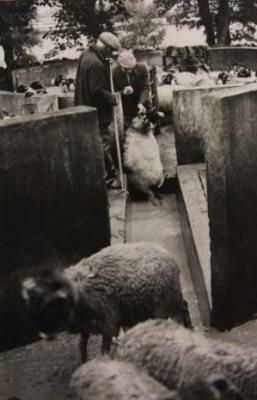 The Dales farmers kept sheep, pigs, cows and poultry, often on hill top farms in isolated locations. Sam Dyson describes how he found his first farm in Stanbury and gradually built up his livestock and farm including egg rounds and milk rounds. He shares entertaining accounts of the difficulties of using a milk separator when the brake was left on and some of the other trials and tribulations of hill farmers. Norman Swindlehurst and Jim Smith describe how Dales hill farmers would pen and shed sheep for shearing and greasing at different times of the year. Anne Margaret Mason of Burtersett describes washing sheep in the local rivers and the rituals at haymaking time. There is a real sense of Dales communities working together to tend the land and livestock against the harsh realities of the Yorkshire weather. Dry stone walls, marching up hill and down dale, are a common feature of the Yorkshire landscape. John Geldard describes the ancient art of dry stone walling in Malham, the names of the different stones used, and the need for a high wall to prevent sheep escaping by jumping over the walls.